Win a Samsung Vibrant from Techlicious! Congratulations to our winner, Kellie, from Lexington, KY! One of our favorite smartphones is the Samsung Vibrant (MSRP $599). 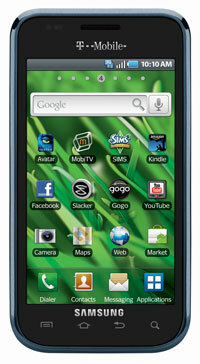 It has a beautiful 4-inch AMOLED display and a slim, light design that makes it easy to slip into your pocket or purse. And we're giving one away to a lucky Techlicious subscriber! The Samsung Vibrant runs Android 2.1 and comes with a number of great features, including a 5MP camera, 720p video recording, that beautiful high-resolution 4-inch AMOLED display and a full version of Avatar pre-loaded. The Samsung Vibrant is for T-Mobile, but can be unlocked to work with AT&T and other GSM carriers. If you're a T-Mobile customer already, just slip your sim card in and you're ready to go! Once you have subscribed, tell us in a comment below "What are your favorite things to read about on Techlicious?" Want an extra chance to win? Become a Fan of the Techlicious Facebook Page. Just "Like" us in the Facebook box and the post a second comment below for your Facebook entry (Yes, we know it's a little bit of a pain to post twice, but we need to track your entries!). Don't post your entry on the Facebook page, we can't accept entries there. We will randomly select one (1) winner from the entries. No purchase is necessary to win. The giveaway will end at 11:59pm on February 22nd, 2011. Void where prohibited. U.S. residents only. Click here for the full rules. I love the productivity tips - easy things to pass along to make our overwhelming tech lives easier. I love the variety of cutting edge products at Techlicious. Hey now I am your FACEBOOK fan too.I LOVE TECHLICIOUS!!! Ooh I love the style of this phone, very sleek. I love reading about phone tech, apps, and laptop/tablet posts best on Techlicious. I’m already a subscriber. Thanks for the chance to win! I like to read your newsletter as they come, all the tech stuff helps me stay current with my teenagers and their gadgets ! I like you facebook as well ! I love reading all of the reviews on new gadgets! I absolutely LOOOOOVVVEEEE reading about all the new electronic gadgets available these days. I also enjoy and find most helpful the tips and hints for using technology.Ooooohhh, I hope I win this phone as I already have T-mobile…LOL! Thanks in advance! Being a mom of a soon to be 16 YO, its great being able to keep up with how to monitor their activity as well as saving money on some of the newest technology. I really like your tech tips and also the product reviews and comparisons. I am a current email newsletter subscriber. I love reading about the 3DTV. I just liked TECHLICIOUS on Facebook, too. I’m one of your facebook fans (Rust Hawk). I enjoy finding good brief articles that teach me about facebook safety, family links online, ereader savings online (and how to load books in various formats), holiday fun sites and digital camera “how to’s”. I love to read about the new phones out there! It is really helpful info! I love reading about iPhone stuff. I just got my first one last week, so I am soaking it all in! I haven’t read anything I haven’t liked. You’re doing a good job. I love reading about the new phones when they come out. I love to read articles regarding technology tips and pros/cons of new tech fads. I’ve been swayed away from my opinion of certain products many times by reading about their features and reviews on Techlicious. Also, helpful improve-your-life-through-technology articles and interesting, unknown information about common or wide known gagets are enjoyable as well. I love the $$ saver articles! I like all the tech info provided by Techlicious. You guys have great articles on everything Tech. Thanks for being here for us. I really love getting these newsletters! Gives me something to talk about with friends! I would love to win this ‘Vibrant’. I enjoy the tech tips and product reviews. I enjoy reading about computers and televisions on this site. I find helpful tips on various subjects almost on a daily basis from your newsletter. Plus the included links to additional topics have rewarded me with links that I save to favorites. As an addicted gadget freak, I find this newsletter very up to date and always me to feed my inner gadget freak. You’re correct, it is a big pain. I like the smart phone comparisons and reviews. REF: Win a Samsung Vibrant from Techlicious! What are my favorite things to read about on Techlicious? Firstly, I’ve learned more about 3DTV here more than any other source, and secondly I understand how apps and eReaders work. The app descriptions and reviews are very helpful and thorough. I like the money savers. I like the money savers. Especially how to find free music and we just made great use of how to sell your old cell phones. I love to read gadgets reviews on your site. I like the name.